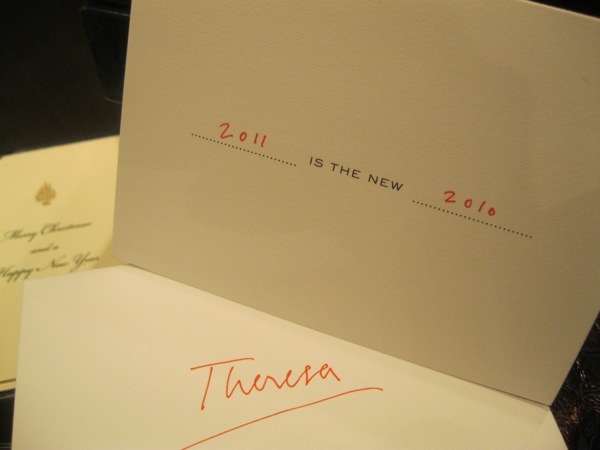 2011 IS THE NEW 2010 – Write with us! I’ve been waiting a while to post this card. It’s from the private collection of Jonathan Arnold at Dempsey & Carroll. It was his holiday card this year and what a statement it makes. In most discussions while waiting to ring in the new year, it’s about new and starting fresh. It’s about eliminating old habits and starting new productive rituals. It’s about setting goals and making resolutions that most of us don’t keep but enjoy going through the exercise. All of this makes us feel like we get a fresh start. But why not consider some things that you don’t want to change. Focus on the positive things you want to carry with you into the new year. At TT Patton we’ve developed some great relationships with our clients and vendors in 2010. We grew our business with writers (young and experienced) and we found some great new products and programs to bring to Barrington. And we’re happy to be among the other great retailers in this historic and booming downtown district. It’s been a great year, that 2010. So in some regards, we really do hope that 2011 is simply the new 2010! Have a safe and happy new year, and we hope you’ll stop by and write memories with us next year!